The following blog was simultaneously published on Sherrill Hogen's blog, News from Sherrill. How old were you 17 years ago? Please, stop and do the math. What has your life contained in those years? What if, instead, in 2002, you had been abducted without given warning or reason, and taken 8000 miles away from your family and country? And left there. And tortured for information you didn’t have. What if that had been your life for the last 17 years? Do you think your captors should be held responsible for your misery? This is the reality for 40 exclusively Muslim men still being held by our government, without charges, at Guantanamo Bay prison, outside U.S. borders and outside U.S. laws, built and maintained in order to tell the world that torture is O.K., indefinite detention is O.K., but Muslims are not O.K.. This disgrace should have been front-page news on January 11, the 17th anniversary of the first men brought to Guantanamo. If you are wondering, as I was, what are the conditions in this prison, the true answer lies in the suffering of indefinite detention. Not one of the 779 men ever held there, has been given a real trial, read the charges against him, allowed to confront his accuser or present his defense. Even without that, all but 40 were released because they were found not to be a threat to the security of the United States. And 5 of the 40 have also been cleared for release, but their freedom is blocked by Trump. What of the other 35? Like the rest, they are human beings. I have not been abducted, chained, tortured, hooded and diapered to be flown in disgusting conditions far from my home. I have not been force-fed with a tube down my throat while strapped to a chair. I have not lost my entire youth without comfort of mother or father. I have not been separated from my young children who have grown up without me. Trump has said he would re-fill Guantanamo, which has the capacity for 2,000 captives. Meanwhile, he has eliminated the government office that was a liaison with the prison, so there can be no movement of anyone’s case, nor can the U.S. track former detainees to know if they present a current threat to U.S. security. (So far the rate of “recidivism” is a very low 4.6%.) But Trump wants those men there where the U.S. legal system can’t reach them and where we citizens can’t remember them. My response, your response, our response must be to acknowledge the humanity of these 40 remaining detainees and demand due process according to our own laws, according to the basic values of every religion, and according to human rights. 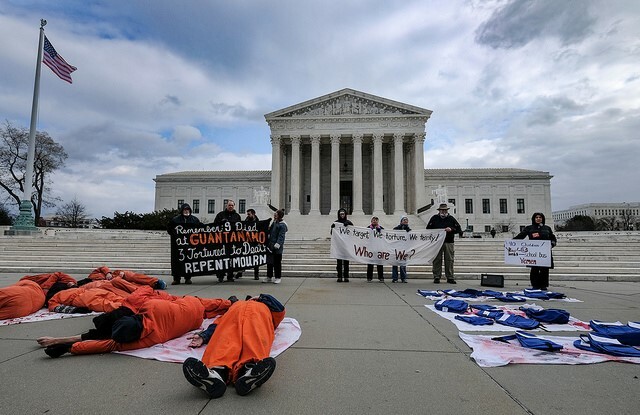 Please ask Congress to hold hearings on Guantanamo. It is not the price tag, ($10 million/year/per prisoner), it is the human tag. Our humanity requires us not to forget these men. Close Guantanamo. 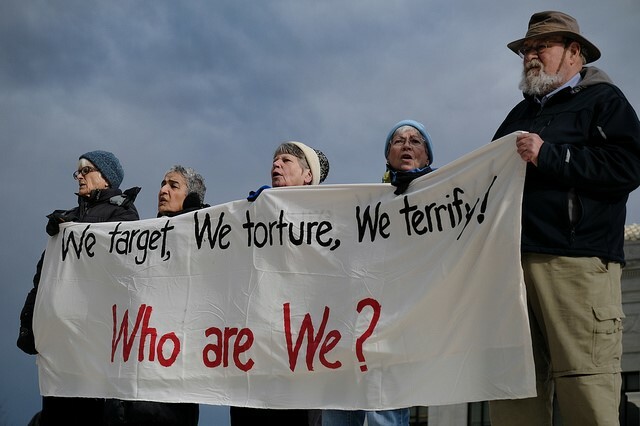 End torture.